Quinn Cook ended his senior season as a national champion after helping lead the Duke Blue Devils to their fifth national title. While his impact may have been overshadowed by heralded freshmen Jahlil Okafor, Tyus Jones and Justise Winslow, Cook was a key cog for the Blue Devils and provided veteran leadership and toughness throughout the season. He has developed into a viable NBA candidate during his four year career in the eyes of NBA scouts and is looking to make a strong impression upon teams leading up to the NBA Draft to continue his playing days at the professional level. Earning a selection to All-ACC 2nd Team as a senior, Cook has played alongside some excellent guards during his tenure at Duke, including Tyus Jones, Seth Curry and Austin Rivers. This has helped him show his potential as a role player and demonstrate how he can contribute to a NBA team as a player who can provide a steady hand from the point guard position while also providing value when playing off the ball. Cook is quick in the open court, both with and without the ball, and is great in transition, where he scored more points this season than any player in this draft class (on excellent efficiency at 1.35 PPP according to Synergy, #2 in this draft). He doesn't get to the rim all that often in the half-court, though, shooting just 91 shots inside the paint and hitting only 45% of his attempts. He will need to improve on his touch on his floaters to become a more effective scorer in the paint, as he doesn't always have the size or athleticism to get all the way to the basket against a set defense. Much of Cook's offensive value comes from his shooting ability, which is much improved from his freshman season. In his first year at Duke, he shot just 25% from beyond the arc but has since grown to become a 40.1% shooter, third among point guards in our top 100. He has a fundamental stroke that should allow him to translate his shooting to NBA distance and give him a way to contribute when off the ball. He's much more comfortable in catch and shoot situations (39%) compared to jumpers off the dribble (34.8%) but he doesn't force many tough jump shots off the dribble that he is uncomfortable attempting. Cook isn't a prolific one on one player in the half-court, but he makes great decisions when using ball screens. While he isn't great at getting all the way to the rim in traffic and finishing, he can turn the corner and use a little burst of speed to get into the paint at times, where he usually likes to find teammates. He is much better as a passer than a scorer and while his assist numbers were not sky-high, as his 2.8 assists per 40 minutes pace adjusted ranks last among point guards in our top 100, this had more to do with him playing off the ball as a senior alongside Tyus Jones than his actual passing ability. He has demonstrated the ability to make the correct pass to give his teammates scoring chances to delivering solid passes with his good instincts and anticipation of the play development. As a junior, he posted an outstanding 4.4 PPR and has a career 2.5/1 assist to turnover ratio. Cook is a superb decision maker, always seeming to make the right pass in the flow of the offense and not forcing the action. He almost never turns the ball over, coughing it up on just 9% of his possessions, and will need that steady hand at the next level to run an efficient offense off the bench. He's extremely efficient as his 61% true shooting percentage is tied for tenth among all players in our top 100. He isn't a ball stopper and will make the right pass in the flow of the offense while take high-efficiency shots, as he doesn't take many low-efficiency mid-range jump shots, attempting just 12 shots from 17 feet to the three point line, according to Synergy Sports Technology. On the defensive side, what Cook lacks in height and length he makes up for in intensity and toughness. A little undersized at 6'2 with a 6'4 wingspan, Cook rarely takes defensive plays off, always harassing the ball handler and disrupting the flow of the opposing offense. He moves his feet well and could pick up the point guard full court if asked to wear out his opponent. While his average physical tools may limit his overall effectiveness somewhat in the NBA, as he won't be able to challenge jump shots or play in the passing lanes, Cook's energy level will always be present and he will play bigger than his size on defense, making him a pest for the opposition. Cook may not have the highest ceiling, but he has grabbed the attention of NBA teams with his leadership potential, toughness, energy and ability to run a second unit offense. Teams looking to round out their bench will give him a serious look leading up to the draft and in summer leagues to see if he can carve out a role at the next level by providing outside shooting, smart decision making with the ball in his hands and defensive intensity. Cook will need to show he can handle the athleticism of NBA competition, as he didn't test well at the NBA combine and that he can continue to be a high-efficiency, steady point guard at the next level. If he can show he can do so, he should play his way into a NBA contract and could become a key contributor in the right situation during his career. Quinn Cook was not having a particularly impressive game early on, struggling with his outside shot and having a difficult time finishing around the basket. He came alive with his team down by 15 points, though, making some big hustle plays and hitting a number of difficult shots, before icing the game at the free throw line. His experience, energy and leadership skills were on full display, as they often were at Duke, and it really wasn't a surprise at all to see him will his team back into the game (and finish the Combine undefeated) considering what we've seen from him over the past four years. While much of the attention for Duke's national title run deservedly went to the freshmen Okafor, Winslow and Tyus Jones, Cook's role shouldn't be understated. He shot 40% from the 3-point line, made 90% of his free throws, played competitive defense every minute he was on the floor, and absolutely never turned the ball over (8.8% TO%, #1 among DX-100 PGs). NBA teams have quietly been talking about his potential as a role player off the bench thanks to his ability to organize, make open shots, compete on defense, and bring superb character to their organization every day thanks to his very strong intangibles. Even if he doesn't get drafted, he'll have a very good chance to make a roster and play a similar role to that of Patrick Mills or Matthew Dellavedova if he can find a way to carve out a niche. Quinn Cook spent his freshman season backing up Austin Rivers and Seth Curry, but came into his own in a major way during his sophomore season. During his second year, Cook saw his minutes jump from 11.7 to over 33 per night, contributing 11.7 points and 5.3 assists on a deep Blue Devils team. While Cook may not have made the same statistical leap in his junior season, at least in terms of per-game stats, his overall efficiency and pace adjusted stats continued to trend in the right direction. His points per 40 minutes pace adjusted increased slightly, from 13.9 to a career-best 15.6, while his efficiency rose, producing a true shooting percentage of 57.1%, a considerable improvement over the 52% he shot in his previous two seasons at Duke. Cook made a huge jump in his proficiency from the perimeter during his sophomore season, and this continues to represent a big portion of his offensive game. Cook shot only 25% (in limited attempts) from three point range during his freshman year, but that jumped up to a very impressive 39.3% on 3.9 attempts per game during his sophomore season. While not quite as prolific, Cook shot 37.1% on over 5 attempts per game during his junior year, which further reinforces that the improvement he showed during his sophomore year was legitimate. Cook remains very effective shooting off the catch, connecting on a very good 38.9% in these situations, which due to the majority of these attempts being beyond the three point line yields an impressive 1.167 points per possession. Cook maintains a good shooting pocket before the pass, and has a compact shooting motion that allows him to get the shot off fairly quickly. Where Cook did make strides this season is shooting off the dribble, one area where struggled during his sophomore year, despite the overall improvement in his shot. Cook shot only 25.9% when shooting off the dribble during his second season, but improved that considerably, connecting on 36.6% during his junior year. Cook does a much better job of getting his feet set and maintaining good balance on these shots. With how much Cook operates in the pick and roll, this was a very important development in his game. Still, Cook's primary threat off the pick and roll is as a passer. Cook has very good instincts as a passer, and makes good reads with the basketball, able to see a play before it develops. While not one to necessarily look for the flashy or high-risk pass, although Cook is capable of displaying impressive court vision and creativity at times, Cook's real gift as a passer is being able to deliver the ball on time and at the right spot. Rarely are Cook's passes off target, allowing his teammates to make take their shots in rhythm. Cook also shows some ability getting to the rim off the pick and roll. While not an explosive athlete, either in terms of his first step or explosion in the lane, Cook is very quick with the ball in his hands, thanks in large part to the excellent control he has with his dribble. With the ability to come around the edge quickly, as well as the ability to change direction on a whim, Cook is able to get by his man and into the paint. While his size, strength, and being a largely below the rim player limits Cook somewhat as a finisher in traffic, he does have good body control and touch with either hand around the hoop. On the defensive side of the court, Cook's short stature, without the huge wingspan or reach to make up for it, are sure to be factors limiting his overall contributions on this end of the court at the next level. Still, Cook plays a tenacious pressure defense away from the hoop that cause some offensive players fits. Cook likes to press his man all the way out to half court at times, and has the foot and hand speed to be disruptive doing so. He also does a fairly good job of fighting through screens for a guy his size, and does a good job of denying his man when playing off the ball. While Cook's physical profile presents some concern on the defensive side of the court at the next level, his struggles will not be due to effort or focus. Overall, Quinn Cook continues to hone his skills and mature into a well-rounded point guard. Cook has had the benefit of playing with many talented players around him, and it will be interesting how he, and the Blue Devils offense, transitions their offense from being centered around Jabari Parker and Rodney Hood to one based around a very different offensive big man in Jahlil Okafor. Similarly, it will be interesting to see how his role evolves this season with the addition of Tyus Jones, who was considered the best point guard in his high school class and is certain to push for major minutes as a freshman. While Cook lacks the elite physical tools for his position that many in the NBA are looking for, his well-rounded, controlled floor game and pressure defense may garner him looks come next June. Last time we checked in on Quinn Cook, he was fresh off an appearance with USA Basketball's U17 National Team prior to his final year of high school in 2010. Earning an invitation to the McDonald's All-American Game and ranking as a consensus top-30 recruit with his play as a senior at Oak Hill Academy, Cook put together a modest freshman campaign in Durham, fighting through a nagging knee injury to average 4 points and 1.6 assists per-game in limited minutes behind a deep guard rotation featuring Tyler Thornton, Seth Curry, and Austin Rivers. Replacing Thornton in Duke's starting lineup just two games into last season, Cook solidified himself as a key player for the Blue Devils as a sophomore. Averaging 11.7 points and 5.3 assists per-contest, the Maryland native had a breakout year, acting as a facilitator in guiding a veteran roster to 30 wins, an Elite 8 appearance, and being named to the All-ACC third team. One of two returning starters from last season's team, Cook will likely once again take the reins of Head Coach Mike Krzyzewski's offense as a junior. With McDonald's All-Americans Jabari Parker and Matt Jones the fold, and Mississippi State transfer Rodney Hood becoming eligible, the onus will be on the 20 year old floor general to integrate the program's talented newcomers by continuing to distribute efficiently and improve as a scorer to help this team overcome the losses of Ryan Kelly, Miles Plumlee, and Seth Curry. If there is one thing the 6'1 guard proved especially adept at last season, it was getting others involved while playing low-mistake basketball. His 6.1 assists per-40 minutes pace adjusted ranked 4th in the ACC last season. On pace to break the career Duke assist-to-turnover ratio record established by Steve Wojciechowski in the late 90's, Cook's 2.6:1 mark over the past two seasons is representative of his reliable play at the point guard position. He is not the type of freak athlete who can put constant pressure on a defense with the threat of his penetration or flashy handle, but he's a savvy passer who reads the floor well, uses his dribble to probe the paint when the opportunity presents itself, creates passing angles, and delivers the ball in a timely manner to open cutters and spot-up shooters alike. As a scorer, Cook made progress last season, though he gets out of control at times. Lacking elite size and leaping ability to score prolifically around the rim, Cook does most of his damage as a jump shooter. Though his shot wasn't falling consistently for stretches last year, he nonetheless knocked down a solid 44% of his catch and shoot jump shots and 39% of his 3-point attempts overall. He struggled a bit from the midrange after shooting well off the dribble as a freshman, connecting on just 26% of his pull-ups as a sophomore. On the whole, Cook's scoring efficiency remained steady while using almost three times as many possessions per-game as he did as a freshman. Scoring at a below-average rate around the basket in the half court and transition and forcing some bad shots in the half court, the name of the game moving forward for Cook is efficiency on the pick and roll. Whether he improves his floater or regains his ability to make shots off the dribble consistently, the more of a threat he can be working off ball-screens the more meaningfully he'll be able to contribute as a scorer both next season and down the road. Though Cook is not a great athlete and lacks great size, he's a vocal, fairly aggressive defensive player in spurts. He showed improvement in his intensity from his freshman season and did a better job keeping players in front of him in the half court as a sophomore. He may not have the physical tools to be a standout individual defender, but if he gets stronger to better deal with ball-screens, he'll have a chance to take another step forward. While Cook may not be a glamorous NBA prospect, he showed marked improvement last season in a significant role and has a number of traits NBA scouts value in a point guard prospect. If he can continue improving as a scorer and defender, he'll certainly rank among the best point guards prospects in his class and at the minimum will get plenty of looks as a backup point guard from the professional ranks. A feisty little point guard with excellent leadership skills and solid passing ability, Quinn Cook did his job well here in Hamburg. He still has room to improve his decision making skills, and he's a bit on the small side, but he's fairly quick and strong and seems to possess excellent intangibles. 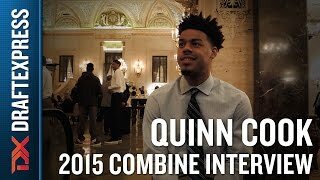 Quinn is an inconsistent offensive player who can score from the perimeter and has the ability to run a team effectively when dialed in, but is prone to making questionable decisions at times with the ball in his hands, particularly when it comes to his shot selection in the half-court. He went through stretches where he forced the issue but was absolutely outstanding in other situations, driving and dishing the ball creatively, making good post entry passes, doing a great job in transition, and looking like a true floor general. His ability to run the pick and roll is already far more advanced than most players his age, and he plays with a swagger that you like to see from your team's primary ball-handler. Quinn is a tough guy who plays with emotion, is very involved in the game, and is highly competitiveall great traits for a young point guard to have. He can also be a bulldog on the defensive end, getting in the passing lanes. He's an absolute pest putting pressure on the ball, even if his lack of size raises concerns for the future if he doesn't grow a bit more. Cook is not the most highly-touted recruit amongst this group but nevertheless has all the makings of an excellent college player.